The city of Alesund is located in the county of More og Romsdal, Western Norway. It’s the capital of Alesund province. The population of the city is about 43,000. The city is surrounded by rugged mountains. It’s a popular fishing port, where every tourist can join in. According to a nationwide survey, Alesund is considered to be the most beautiful city in Norway. Cruise ships dock in Stornespiren/Prestebrygga terminal, which is found south to the city center. The port is within a walking distance to the majority of sites. The cruise ship pier was enhanced for 200 meters in 2012. The local currency is called Norwegian Krone. ATMs are available in the city and are called MiniBanks. However, it is better to use credit cards for restaurants and shops. There are not so many currency exchange spots, so the best place to buy Krone is the Tourist Center of Alesund. 10 Krone is equal to 1.20 - 1.60 Dollar. As a typical Scandinavian country, Norway is famous for extremely high prices for everything, including food and transport. Make sure to have a lot of money when visiting Norway. There are no free Wi-Fi spots in the city. Libraries do offer Internet access, and some cafes have Wi-Fi connections, which are, however, protected with a password. 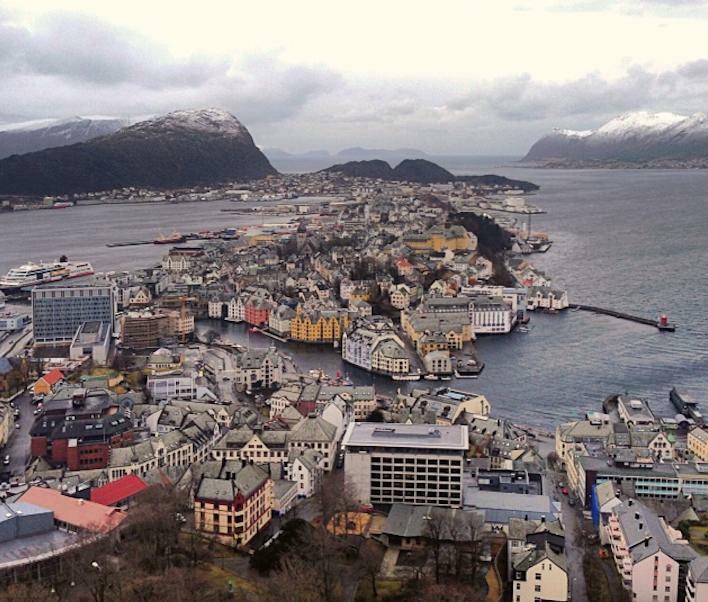 Alesund has cool summers, and windy winters. The climate is marked with a considerable level of humidity. The minimum temperature is - 3°C and the maximum is 20°C. The warmest season is from June 24th to September 14. The cold season starts on November 21 and lasts till March 30. Despite this, you need to dress warmly even in summer, it’s never very warm or hot in Alesund. The local language is Norwegian, which is very similar to Finnish and Swedish. English is widely used by the locals and businesses. Some restaurants have bilingual menus. As the city is very small and simple, there are not too many options for sightseeing. The main places of interest are connected to the natural wonders and historic sites. o	City architecture – Alesund itself is an art exhibition. All buildings belong to the popular Art Nouveau style, which creates a magical atmosphere. o	Sunnmore Museum is 4 km (2,4 miles) away form the city center. It is an open-air exhibition that consists of an old village and a museum. It displays the life of the locals before the fire of 1904, when all the houses were built of wood. The walls are compiled of logs, and roofs are covered with plants. There are farms, schools, and shops that date back to the 15th century. The Viking culture and history is also displayed in this museum. It has 50 houses and a huge replica of a ship dating back to 400 AD. o	Atlantic Sea Park is one of the largest aquariums in Northern Europe. It contains a beautiful environment where the sea creatures of the Arctic Ocean feel completely at home. o	Mount Aksia is a budget destination and a great choice for photographers. There is fantastic panorama of the city and the surrounding nature at the end of 418 stairs you’ll need to climb. o	The Troll Stairs is a road to the mystical mountains, where you can see waterfalls, deep gorges and stunning fogs. Norwegians believe that the mountains are nothing less than trolls, which play a crucial role in local mythology. Make sure to visit the famous Troll’s Tongue; an extreme rock formation that looks like a viewing platform. 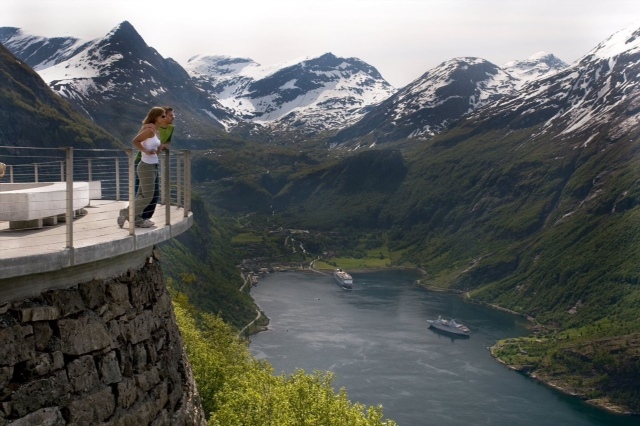 o	Geiranger Fjord is the most beautiful fjord in the world, according to UNESCO. It lies between spiky green mountains adorned with waterfalls. o	Fishing – You can rent a fishing rod from the tourist center. Just leave 50 Krone, which you will get back after returning the rod. Fishing is allowed everywhere, no license is required, and it’s completely free. Alesund is a small city, and everything is available within walking distance (around 20 minutes). Public transport includes buses and trains, which are very expensive. However, if you are planning to go out of the city boundaries, it is better to rent a car, take a ferry or ask the locals for a free ride. Local cuisine mainly consist of seafood – different types of fish prepared in different ways. Restaurants and cafes serve both international and local cuisine. Try the two major exports of the city - cod and herring. You can also taste seal or whale meat. These are served in restaurants, rather in cafes. Crayfish, shrimp and salmon are also very popular. Dishes are not very big, so you might get a very small piece of whale meat for a high price. Ask the waiter about the amount of food served on the plate, before ordering, especially, if you are hungry. Another local dish is compiled with a variety of open-faced sandwiches, which are seasoned with everything you can find in the fridge. While tipping the waiters is not compulsory, the locals usually show some generosity when paying the bill. The area was previously populated by Vikings. A seaport with around 300 inhabitants was founded here in 1700s. It received the status of a city in 1848, when the population increased to 1200. Since then, it has been a regional center for religion, culture, and trade. In 1904, Alesund was entirely comprised of wooden houses, when a fire broke out burning the whole city down (more than 850 houses were destroyed). As Alesund used to be the favorite vacation spot for Emperor William II, he sent numerous military ships loaded with building materials, medicine, workers and everything needed for a construction of a new town. Besides the active international aid, architects around the world joined their forces to design the new city in Gothic and Art Neaveau styles. This time wood was replaced with more solid materials like brick. The Norwegian version of Art Neaveau is decorated with images from Norse Mythology. There are a lot of dragons, trolls, and other mythical creatures depicted on the facades and sculptures. Locals are calm and polite. Self-control, modesty and adequate reaction are what makes a Norwegian man. So, avoid talking or laughing loudly, boasting, showing too much affection and anything else that locals may label “too much.” Personal space and privacy is extremely important. On the contrary, the Norwegians are very friendly and informal. They are always ready to help strangers.